Knowing more about your abdominal anatomy can help you get even more out of your abs exercise. Have you ever wondered if your abs are just one big muscle or divided up into several muscles? 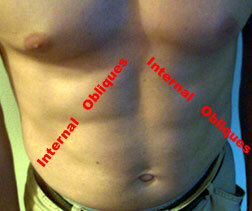 Your ab muscles are made up of your rectus abdominals, internal obliques, external obliques and transverse abdominals. The pictures below show you the direction the muscles are positioned. Find out how to test your abdominal muscle strength. 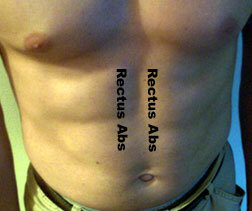 Rectus Abdominals - They are the most commonly known abdominal muscle, your "6 pack". Their job is to bend your back forward, the same movement involved in a basic crunch. 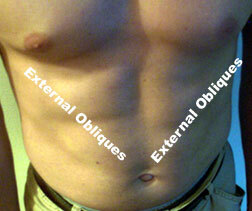 Internal and External Obliques - Their job is to twist your body and bend your back to the side. Because of their angled position, they can help flatten your stomach helping shrink your waist line and love handles. The obliques are also very important in many sports. 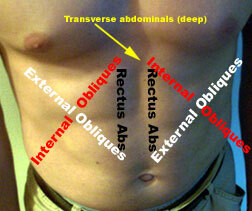 Transverse Abdominals- A very deep muscle that acts like a weight belt or back brace to stabilize your back. Learn more about your muscle anatomy with this muscle map & explanation. 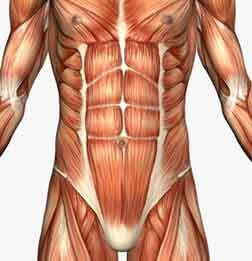 Return from Abdominal Muscle Anatomy to Abs Exercise Advice home page.